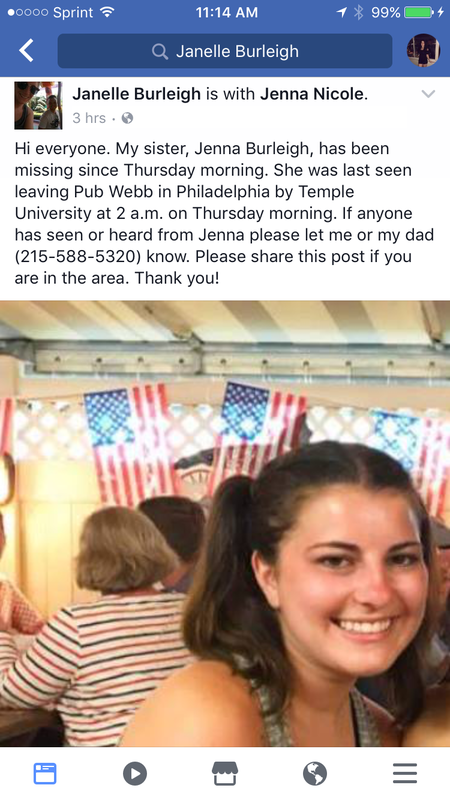 A Temple student is reportedly missing following a night out at Pub Webb. Janelle Burleigh made a public post asking if anyone has seen or heard from her sister, Jenna Burleigh. The post included a tag of Burleigh's profile and her fathers contact information in case anyone has any information. "All we know is that Jenna left the bar at 2am and her phone died around that time too," Janelle Burleigh said. The family has already reached out to their local authorities, as well as Temple Police. After talking to TUPD, Burleigh's aunt, Maureen Zazyczny, claims Burleigh left the bar with an unnamed man who was later questioned by police. According to Zazyczny, the man said in the interview he and Burleigh parted ways later that night, and he hasn't seen her since. This man is now being identified as Joshua Hupperterz, who was seen walking with Burleigh to his house early Thursday morning on local surveillance cameras. Police executed a search warrant for Hupperterz's home where they found blood spattered near the kitchen sink, rear door, and on a trash can lid, along with 10 to 15 pillow-case size bags of marijuana and about $20,000 in cash, according to Philly.com. A neighbor had also heard screams coming from Hupperterz's home around 4 a.m. Thursday. 6ABC has reported that this man's house was searched overnight on the 1700 block of North 16th Street, though nothing was found and no charges have been filed. Burleigh is a film and fashion major in her first year at Temple after graduating from Montgomery County Community College. If anyone has any additional information on her whereabouts please contact TUPD at 215-204-1234. This story is still developing, we will continue to update it as more information becomes available.